I went wet with the camper when I was at the panhandle of FL. I have two drains one gray water (sink) and one black (toilet). 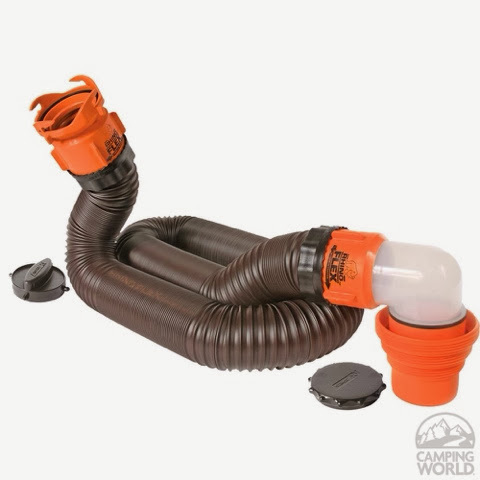 Most campers have one connection to drain both although they have separate valves. My camper has two connections with separate valves. Up to now I just drained the gray water connection in the pipe by holding the hose to the drain hole when I open the valve. I have not used the on-board toilet. Well, I was told here at the Tucson Fairgrounds that I must have the proper connection to fit to the drain pipe. I went to check out all the parts I have and I have a drain connection parts, but the drain hose will not connect to the part that connects to the drain pipe. It appears that the drain hose is old and will no expand to fit the drain connection. Not much good if it doesn't work. The woman informed me that there is a camping world store here in Tucson. Tomorrow I will be stopping for new parts tomorrow am to connect correctly in the future. This is what I need when I am done.